Like the mountain range that inspired it, 1144 Fifteenth rose from earth to sky only when all conditions were right. 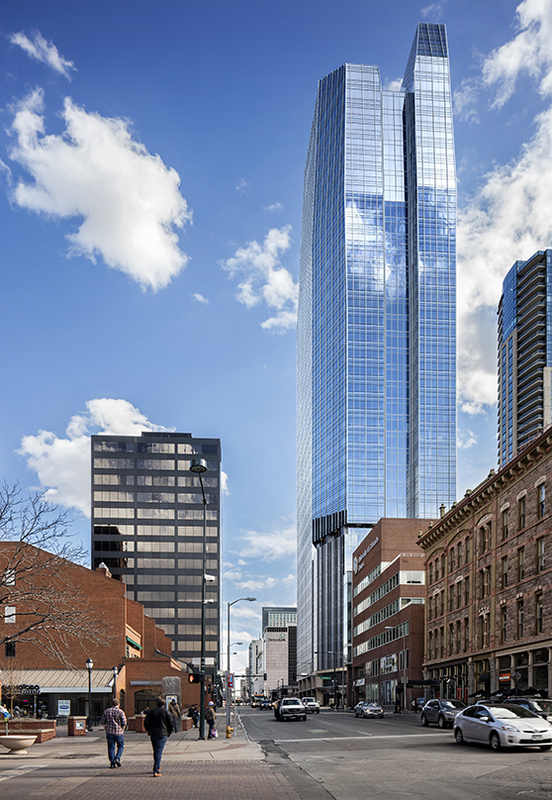 Both subtle and seismic shifts in the real estate market, the national economy, design technology and tenant expectations have pushed and shaped the tallest modern office tower on the Denver skyline into the form it takes today. The origins of this pivotal Hines development actually began in the Pickard Chilton studio nearly 20 years ago. Peaks and valleys. Pickard Chilton’s history in Denver began with the studio’s design of 4600 South Syracuse, a corporate headquarters completed with Hines in 2000. Located in the Denver Tech Center, the building provided premium office and conference space in the new district. With the success of this project, Pickard Chilton was approached by Hines to design a larger office tower downtown. Turn-of-the-century downtown office market conditions were uncertain for a tower at the scale envisioned, and Hines placed the project on hold. Although interest in 1144 Fifteenth was renewed in 2007, the 2008 economic downturn again postponed the project’s development. A heightened awareness of market vulnerability for speculative office buildings factored into the decision. Designing “on spec” was considered risky without securing a key tenant for a project of this undertaking. By early 2014, the market in Denver had changed. The transformation of Union Station into a mixed-use development and the luxurious Four Seasons were attracting new clientele that were spending a great deal of time in the district. The site was a prime location for employers and employees who would be attracted to the neighborhood’s upscale amenities. The opportunity was there to harness the momentum of the neighborhood and construct Class A office space. After nearly two decades of analyzing the site’s urban context, the economic climate, tenant expectations and the aging office space available in Denver, Hines believed the project’s moment had arrived. The tallest office building to be constructed in Denver in 30 years received the green light from Hines and was scheduled for an accelerated completion in 2018. In prioritizing sustainability, 1144 Fifteenth was designed from the inside out to provide an optimal and healthful user experience and to achieve LEED New Construction Gold certification. New heights. The building has evolved dramatically since the project’s first iteration in 1999; its ultimate design is a result of lessons learned from previous iterations to best respond to today’s market conditions and workplace expectations. The tower has benefited from advances in technology coupled with the firm’s growing expertise in sustainable design. In 2005, the firm’s design of the CalPERS Headquarters Complex in Sacramento, California, was one of the first and largest projects to achieve LEED New Construction Gold status. Since then, Pickard Chilton has gained even deeper experience in quantifying and qualifying a successful LEED project. Fundamental sustainable design elements, including ample access to daylight and use of natural materials, were incorporated into 1144 Fifteenth since its inception, while the building’s massing and orientation for energy efficiency, flexible 25,000-square-foot floor plates, 10-foot floor-to-ceiling windows and unobstructed mountain views have remained integral to the tower’s design from the start. In prioritizing sustainability, 1144 Fifteenth was designed from the inside out to provide an optimal and healthful user experience and to achieve LEED-NC Gold certification. The 40-story tower’s form bridges the Denver skyline with the Rocky Mountains, an effect that has evolved but remained a design mainstay throughout. The evolution of the crown from the original stepped form to the final jewel-like shape was made possible with the development of architectural modeling software. Advanced building information modeling technology played a key role in morphing the building into two faceted, sweeping mountain-like peaks and achieving the intricate design on an accelerated three-year construction schedule. Reaching the summit. While designers and constructors were adding new technology to their toolboxes, the way corporate employees work and interact also was changing in response to technology. Because a virtual office can be created at a kitchen table, workplaces have evolved. They are no longer just spaces in which work gets done. Today’s office building fosters creativity, community, well-being and employee and civic pride. Despite not having tenants when construction began, Hines and Pickard Chilton integrated amenities prospective occupants would expect, blending those of a hotel with office space. The second-story tenant lounge features a welcoming fireplace, comfortable seating and workspaces for employees to hold informal meetings, relax or catch up with colleagues. A sophisticated 5,000-sf fitness center was designed to encourage health and wellness. These communal amenity spaces are new to the final iteration of 1144 Fifteenth’s design. If a fitness center was part of a building’s program two decades ago, it likely would have been relegated to the basement or another subpar location. The fitness center is prominently located on the second floor near the tenant lounge to celebrate wellness and promote a healthy lifestyle. The lounge speaks to the building’s commitment to work-life balance and promotes socialization and interaction between diverse tenants. Trailblazing. Opening this month, 1144 Fifteenth is already 65 percent leased, surmounting the potential risks of the city’s speculative office market. Where the tower meets the ground, a spectacular triple-height lobby outfitted with locally inspired natural materials welcomes such Denver native companies as Chipotle, Optiv and Gates Corp. Elegantly designed across time in creative and utilitarian response to market conditions, 1144 Fifteenth will continue to serve as a catalyst of development by attracting new businesses to take residence downtown, strengthening the density of the workforce and bringing new and diverse populations to Denver. Featured in CREJ’s March 2018 Office Properties Quarterly. Photo © Raul J Garcia Astula.